For the past week or so, I have been attempting to hunt down a second job for the summer. And so far, I have had no avail. But to prepare myself for the coming interview process, I have begun to plan out several ways in which I can look professional, but still fashionable as well. Working at Le Chateau somewhat gives me an advantage here. All of the clothes we carry in store (Or most of them) are business casual, but still retain that chic aspect to them (like I said, most of them). This makes it easy for me to be able to put together interview-appropriate outfits that still have a little something to them. The main thing is comfort. you want to make sure you are comfortable in what you are wearing, because you are bound to be nervous. Why wear something brand new and feel like you’re falling out in all the wrong places? Make sure it is something you have worn several times before, and pair it with a staple piece in your wardrobe. That way, you will feel more you in the interview. I used this trick with my interview at Le Chateau, wearing my Oxblood high-waisted pants, a nice black top with simple lace detailing, and my holy grail tan blazer. I felt great in the outfit because it was something I had worn before, and I kept my shoes the same way, putting on some black flats. Structure is also key. If the job you are applying for is more of a formal business setting, then a blazer and dress pants are a must. I wouldn’t try and pull a pencil skirt for this one. Too many things could go wrong with that. An outfit that I would do would be a skinny black cigarette-style dress pant, a solid-coloured or printed shirt that is on-trend, and a fitted white blazer. Don’t do the boyfriend style, as it tends to look more casual and lack shape. A crisp, white blazer that fits you perfectly is the key to this look. It says “I care about current trends, but I also mean business”. Also, all of these pieces you could easily use again in the future. Who wouldn’t rock a clean, white blazer to a dinner party? Sometimes you need to step back and take in the landscape. Or, in this case, the art. My university is very art based, and these paintings done by the visual arts students set the perfect background for this laid-back, hipster-influenced outfit. I wanted to go for comfortable yet chic, but I still wanted to play with some edge. 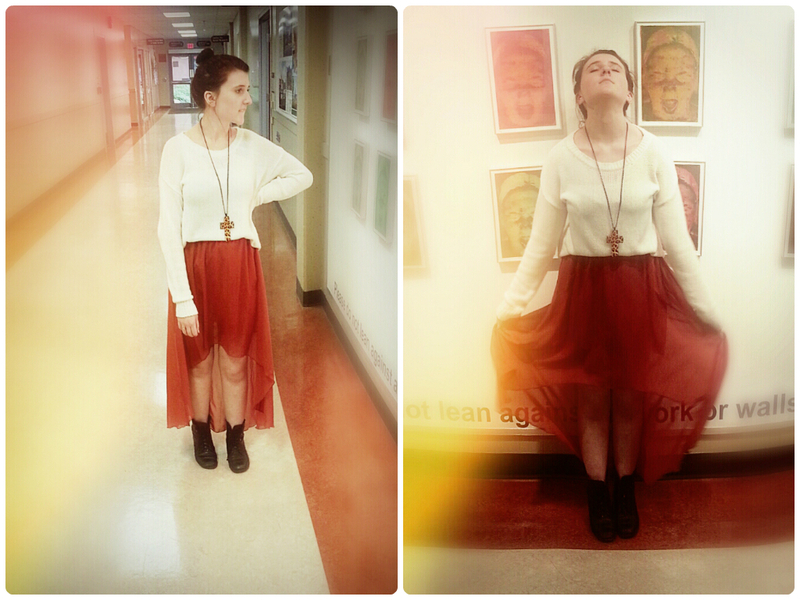 I put on my all-time favourite knit sweater, and tucked it into my pumpkin high-to-low skirt. I liked the way it was taking the colour of my favourite season, fall, and contrasting it with a crisp, spring white. To add that edge I mentioned earlier, I opted out on my JC Litas–which would have been my first choice for this look–and stuck with my vintage combat boots. The great thing about these babies is that they were locally made here, in Canada! Finally, for my very basic accessories, I went for my favourite cross necklace. Normally, I flip it to the black side, but I felt my outfit needed a little… something. So I turned to the Leopard print instead. Thanks to Sonia for working with the lighting on these ones! Oh, and putting up with all the people walking by. That was fun (not). Mixing fashion, school, and work is overwhelming. Writing for the newspaper, taking on a full course load, plus working at Le Chateau has got me exhausted. Sigh. I apologize in advance for being so slow on my posts, but as you can see from my first sentence, I have a ton on my plate at this moment. I will try and do a post every Thursday and either Saturday or Sunday. Thursday will more than likely be OOTD, due to the fact that I have my photographer that day (yay Sonia!). The weekend posts might be more trend or written posts. We’ll see. I write the fashion columns for my university’s newspaper, so doing one of those every week and plus a news column occasionally kind of makes me not want to write a full-fledged fashion article on here (and, alas, I cannot re-post what I send in to my editor because that, ladies and gents, is copyright infringement. I think.). But again, we shall see. Maybe I will feel up to it. Also, I run a Tumblr, though that does not take much effort. But it is a vital part of my life that I am completely and utterly unwilling to give up. Sorry I’m not sorry. If you all didn’t know, I have started this blog as a way to get going on my fashion journalism career that I am currently pursuing. Yes, it’s a bit far-fetched, thinking I could run a successful fashion blog, but I am one to dream big. I am still learning so much about fashion, and I find this is the best place to express my growing knowledge and, again, learn more. So, bare with me.